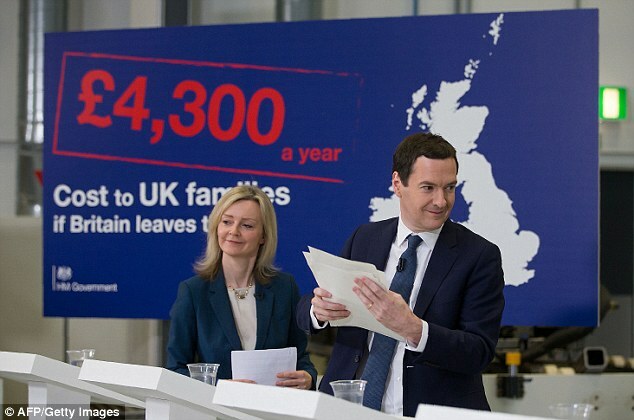 George Osborne announced earlier in the week that leaving the EU will cost every household £4,300 per year. Economists laughed at him and even the BBC briefly published an article explaining why his dodgy dossier was dodgy before "fixing it" to get it back on message. But just how dodgy is Gideon's dodgy dossier? The "model" that was used to come up with the £4,300 per year cost of leaving the EU makes some assumptions. It assumes that we will end up with the same trade deal with the EU as Canada. Why Canada? No idea but it was probably chosen for its unsuitability to the UK's relationship with the EU but the main reason is probably that the Canadian free trade agreement has yet to come into force for the EU so the figures they use are conveniently unverifiable guesswork. The model also assumes that there will be slow economic growth and that the British government - specifically George Osborne's department - will impose tariffs on EU imports. Assuming these worst case scenarios - economic depression and deliberate economic suicide by the Treasury - come to bear at the same time and we have the same trade deal as Canada and Canada's trade deal turns out to be rubbish then the model says GDP will be reduced by £36bn a year by 2030. So how has the Chancellor got from a £36bn in GDP - the value of the economic activity of people and businesses in the UK - to Brexit resulting in a reduction in household income of £4,300 per year? The answer is that he hasn't. Or rather, he has made a link between the two but it's nonsense. The £36bn reduction in GDP in 2030 has been divided by the estimated number of households in the UK in 2013 from statistics provided by the Office of National Statistics. This is the Office of National Statistics that tells us that 257,000 EU immigrants came to live here last year whilst HMRC issued 630,000 National Insurance numbers to EU immigrants in the same period. So if you divide this hypothetical £36bn by what the ONS guessed were the number of households in the UK three years ago (rather than the projected number of households in 2030) then you arrive at a figure of around £4,300. But actually, you don't because even the maths is wrong. There are approximately 26.7m households in the UK and 1/2,600,000th of £36bn is £13,483 so where has the £4,300 come from? Claiming that every household would be £13,483 per year worse off by leaving the EU would convince absolutely nobody bu £4,300 per year? That's kind of believable if you didn't know better and were in the habit of believing economically illiterate politicians. But it gets better. If GDP was directly linked to household income as George's dodgy dossier suggests then the average household income of the UK would be £719,101 per year! Imagine you get a knock at the door from a gas and electricity supplier who tells you they're going to save you money. They then proceed to tell you that based on your next door neighbour's tariff, your monthly phone bill and the amount of electricity your mum and dad used when you were 12, your current supplier will be overcharging you for your gas by £10,000 per year in 14 years' time would you give sign on the dotted line? Or would you laugh in their face and get back to Coronation Street? Osborne's claims aren't even thinly disguised dishonesty, they are blatant fearmongering nonsense. The numbers don't add up, he's comparing apples with oranges and making assumptions based on dodgy statistics and guesswork to come up with an outrageous but just about believable headline for the papers.